Identifier: belltelephonemag13amerrich (find matches) Title: Bell telephone magazine Year: 1922 (1920s) Authors: American Telephone and Telegraph Company American Telephone and Telegraph Company. Information Dept Subjects: Telephone Publisher: (New York, American Telephone and Telegraph Co., etc.) Contributing Library: Prelinger Library Digitizing Sponsor: Internet Archive View Book Page: Book Viewer About This Book: Catalog Entry View All Images: All Images From Book Click here to view book online to see this illustration in context in a browseable online version of this book. Text Appearing Before Image: cal a task as manyothers in telephone engineering. Names used for such pur-poses are, where possible, those of the communities or neigh-borhoods served; but in a city or region served by many offices,each name must not only be easily read and easily spoken bytelephone callers but must sound quite unlike any other usedin that general section. In addition, for dialing purposes, it is ordinarily necessaryfor each name of a central office within a given dialing areato have letters which provide a different combination of dialpulls from those of any other name within the areas. Thus,where there are many central offices and prospect of more, thereis a limit to the suitable names which can be found. Themethod of designation used must meet the needs of futuregrowth as well as present requirements. In New York City,this limit was approached several years ago. 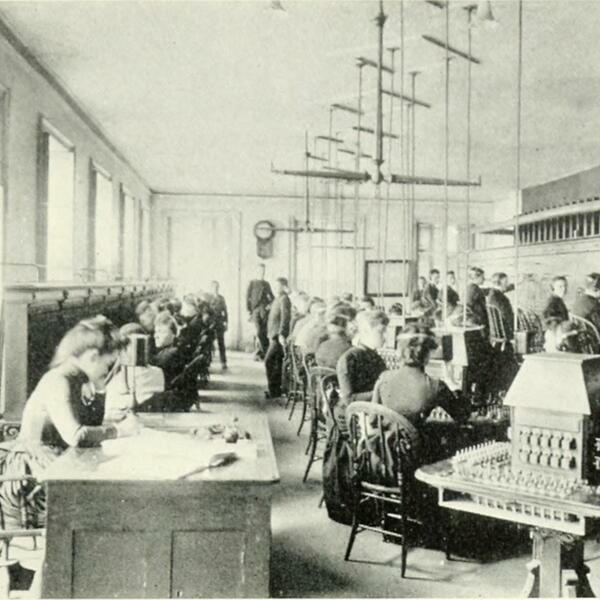 This problemhas been met by giving the same name to one or more officesbut adding for each office a distinguishing numeral—as, for 248 Text Appearing After Image: A Xhu York City Central Office in the 80s, Showing Blehive as well asEarly Desk Type Switchboards, and Both Young Women and Bo\ Operators Note About Images Please note that these images are extracted from scanned page images that may have been digitally enhanced for readability - coloration and appearance of these illustrations may not perfectly resemble the original work.